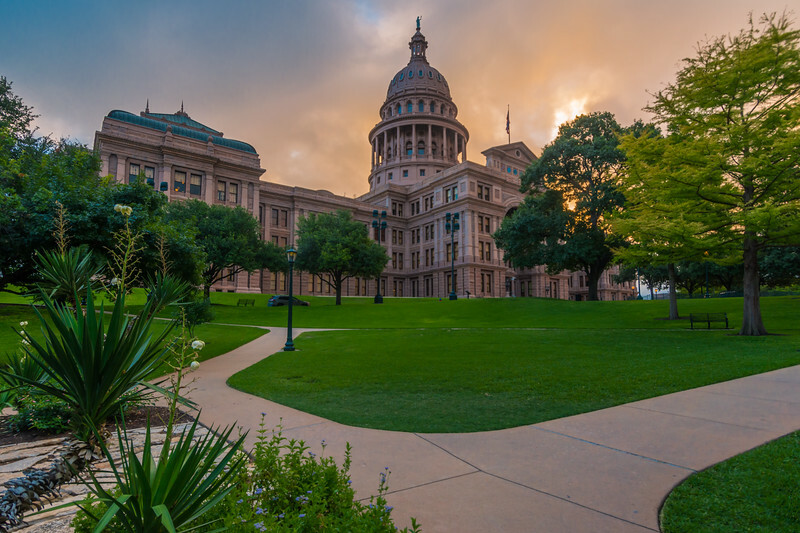 Texas State Capitol building with Path at sunrise. Every once in awhile, there’s that one photo that a photographer is really proud of, and for me this is one of them. On a early June morning, all the right ingredients took place. Typically there is some light foot traffic around the Capitol grounds, but for once I got a lucky bounce. Now in regards to the sky, that’s a whole other story. When I arrived the sky was navy blue, keeping in mind that blue hour had just ended. Out of the corner of my right eye, I started noticing some nice yellowy-orange clouds (that would soon morphed to peach) rolling in towards the Capitol building. I included the path with the yuccas, for the mere fact that it’s a shot that I have wanted to check off. I just needed to wait for the right moment for the unexpected colorful clouds to hover over the building itself, to help tie this photo all together.